The Trinity River is controlled by two upstream dams: the Trinity Dam and Lewiston Dam, which creates Whiskeytown Reservoir just outside of Redding. Despite the upstream dams and reservoirs, the Trinity is remarkably clear and clean. In terms of flows, it seems to have the best of all situations for California boaters. It is dam-controlled, rain-fed, and snow-fed, meaning that it can potentially flow year-round. The best flows are above 1000 cfs (up to 3000 cfs on Burnt Ranch and up to 8000 cfs on Pigeon Point). The flows on the Lower Trinity can be much higher because of the tributaries adding water. This is a nice alternative to the standard summer California rivers: the South and Middle Fork American, Tuolumne, Kern, and Cherry Creek. 500 – 1500 CFS = Low flows. The water moves slower, but the rocks start emerging at the lower summer flows. 1500 – 3000 CFS = Medium flows. Best flows for both Burnt Ranch and Pigeon Point Runs. 3000 – 5000 CFS = High flows on Burnt Ranch. Medium-high flows on Pigeon Point. Great for experienced rafters and kayakers. Especially in the Gorge, be careful of higher flows. 5000 – 8000 CFS = High flows on Pigeon Point. It is not recommended to run Burnt Ranch over 5000 cfs. Many of the rapids on the Pigeon Point run get washed out at high flows. Expect very swift-moving water and big hydraulics. Water levels change quickly on the Trinity during the rainy season, and especially in Burnt Ranch Gorge, it’s important to know what the river is like at each level. During the summer, flows are released and are more consistent. 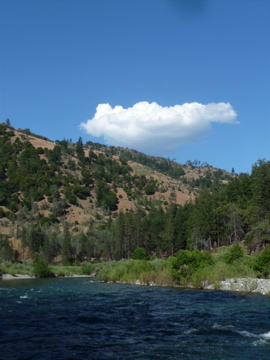 The Trinity River headwaters are within miles of headwaters of the Scott River, Shasta River, and the Sacramento River headwaters in the Trinity Alps near Mt. Shasta and Redding. From there, the four rivers head off in different directions, with the Trinity River flowing southwest and then west toward the Pacific Ocean. The Trinity is the longest, largest tributary to the Klamath River and is known for great rapids, pristine scenery, excellent fishing, and a long gold mining history.